Wagrain is situated at the bottom of the Kleinarlerdal and only 5 km away from our accommodation. At an altitude of 838 meters it has about 3,100 inhabitants. The bustling town with has plenty of entertainment in the winter months and its nice center is pleasantly busy. The center of Wagrain has several restaurants and a number of nice apres ski places open into the late hours. The village has a special history. Joseph Mohr wrote his famous Christmas carol “Silent Night” here. 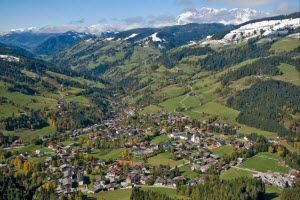 From Wagrain you have a view of two famous ski mountains: the Grafenberg and the Grießenkareck. The Grafenberg is connected to the ski resort of Sankt Johann im Pongau and the Grießenkareck to that of Flachau. Looking up in Wagrain you can see two cabins hover above the village. This is the G-link, which connects the two mountains. There is not only a good bus service but also a lift connection between the two ski areas. Located approximately 10 km from the A10 motorway and 15 km from the N311, Wagrain is easily accessible. Wasserwelt Wagrain is Wagrain swimming pool offering an excellent alternative to a day of winter sports. You can relax in the indoor pool after a great day of skiing in the Ski Amadé. The spacious wellness center is a welcome luxury for the adults, the rapid and extra long slides are great for the kids. At our accommodation you can get discount tickets for Wasserwelt Wagrain. Do you want to visit Wagrain? Want to discover Wagrain skiing on the two magnificent mountains? Book an overnight stay at our accommodation, and you are assured of a carefree holiday. The ski bus to Wagrain stops in front of our accommodation.